Very few people in Ireland can state they are familiar with observing Cranes, and if we are to imagine what our ancestors observed, it is important we review a salient description of Cranes from the modern literature. 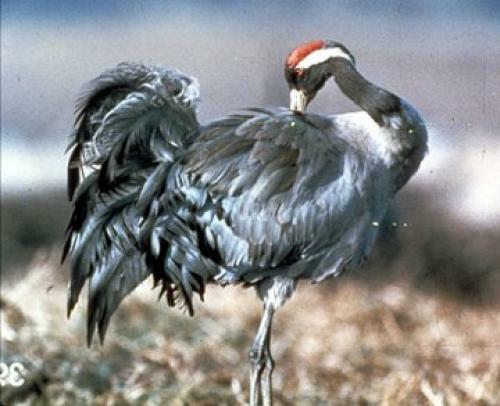 The following description is a summary of the account from the respected Collins Bird Guide: Crane, "Breeds sparsely on bogs in boreal forests, in reedbeds in lakes and along rivers in forests, mainly in deserted regions. Spectacular dancing display mainly in spring by pair or involving hundreds of birds (mostly immature) at favoured sites. The display involves walking with erect, stiff neck, sometimes with raised wings, leaping into the air with beating wings, bowing, picking up items from the ground and tossing them up, freezes in erect posture before shaking plumage. Huge, with very long legs and long narrow neck. Plummage mainly pale bluish-grey, but most breeding birds acquire a rusty-brown back from staining with bog water during incubation. Head and upper neck black and white, bare skin of hind crown red (size of red varying). Bill straight, medium long, dagger shaped. Cranes are notably wary. Elongated tertials extremely bulky and disorderly, giving impression of almost Ostrich like, bushy tail. Flight feathers grey-black, contrastingly darker than coverts and body. When duetting, (neck erect, bill pointing up, tertials and breast-feathers fluffed up) wings of male half open and female not. Majestic flight with slow wing beats and rather flat wings, neck and legs outstretched (Grey heron differs in having neck withdrawn). Expert in soaring flight but will also use active flight on migration, then forming V-shaped flock or oblique line, flight altitude often supremely high, speed moderate. Gait measured and stately, but can be quick when chasing a fox away from young. Juvenile immediately distinguished by rather pale rufous brown head and upper neck, lacking the black, white and red pattern of adult, and less bulky tertials. Vocal, calls loud and far carrying. Contact call (mainly in flight) deep, resounding, trilling or jarring krro and karr. Young in the autumn have peculiar piping cheerp, mixing with deep adult calls. Pair sounds the reveille (duet-call) at breeding site in early dawn (or during light summer nights in the North), male uttering loud trumpeting krrroo and female (immediately after) lower pitched kraw and sometimes hard, knocking ka-ka-ka."